The BBC has launched five new HD channels. 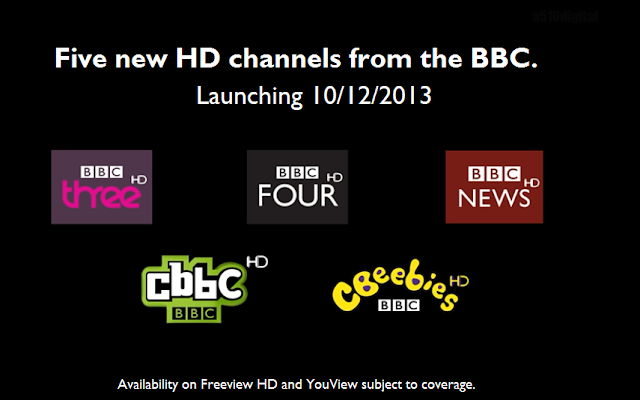 BBC Three, BBC Four, CBBC, CBeebies and BBC News are now distributed in high definition. The channels are available on all major digital TV platforms. Coverage of BBC Four HD, BBC News HD and CBeebies HD on Freeview HD is limited, with the channels being distributed via commercial multiplex operator Arqiva, who have switched on their extra Freeview HD service to around 50% of UK households, with further coverage expansion to follow in 2014. All five new HD channels broadcast the same programmes as their standard definition equivalents in HD. Amendment made to the above article: BBC News HD Sky channel updated 07/01/2014.